Here’s the vehicle! Dad built a custom plywood frame so we could get 6 moving lights, our haze machine, sound equipment, 4 speakers, 1 sub woofer, two pianos, 1 bass, 1 cello, 5 violins and violas, CDs and product table stuff for the whole tour, costume changes, and our luggage into one Transit van! Yep. Dad is a master packer and an amazing engineer. One seat per person and none to spare! It’s our accommodations for 3 weeks of travel! 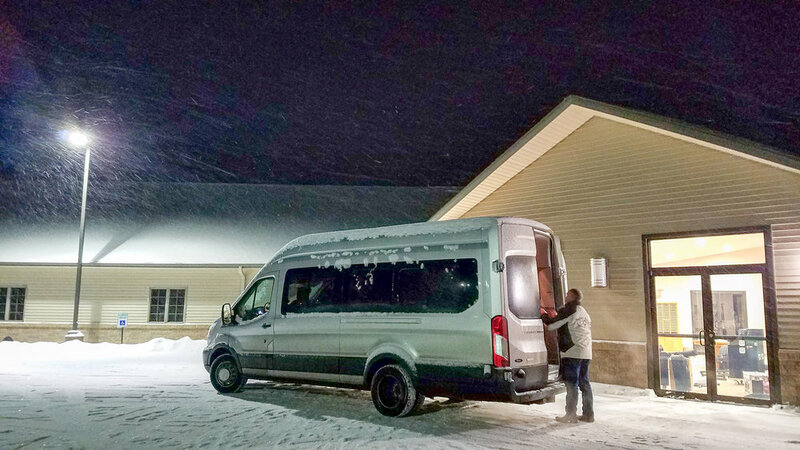 Since we can’t leave any of the equipment in the vehicle due to extreme temperatures, we have to load and unload the van 2-4 times per day… no mater the weather! Have any of you been to Wall Drug??? The picture above pretty much sums up our reactions! Below, Luke is with the WORLD FAMOUS… ummmm…. animal of some sort? We were on a long drive in between shows, but we had just enough time to swing by and get a quick glimpse of the Badlands covered in a fresh blanket of snow! Mt. Rushmore only took us another hour or two out of the way, and since we were doing a hundred, what’s one more? We got to have both places almost totally to ourselves! I guess no one else thought it was a good idea during ice and snow! Everyone was SO nice! The hospitality we received at each place and the people we met were amazingly wonderful! Thanks to all of you! We had so many packed venues! Finding places to do quick outfit changes during the middle of our shows was an interesting experience!! Take a look for yourself! Doing a quick, 2-3 minute change in a pantry? Or running up a flight of stairs (SOFTLY) in the middle of a show, down a hall, and ending up here as your dressing room? Maybe you could call this an “artsy” dressing room? 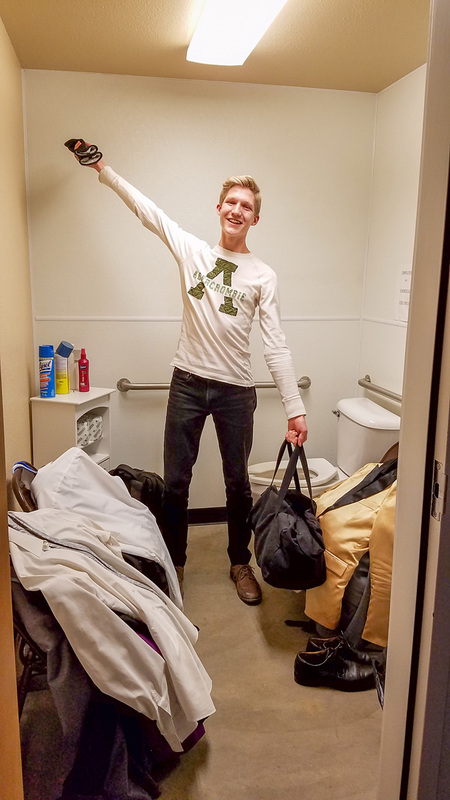 It served its purpose since we needed quick change rooms! Such a fantastic group of people! You guys are the best! In Montana, Glendive Dinosaur and Fossil Museum opened up just for us and gave us an exceptional guided tour! Our guide was incredibly knowledgeable and the array of real fossils, reproductions, and representations was astonishing! There are many fossil digs around the area and they have even taken Buddy Davis out to be filmed at a dig site. We even got to see the back room where they had some fossils they had unearthed and were working on cleaning up with their specialized equipment for display! Yeah - more snow! …Pretty much every day when we were in that state! …Live in this location? Which would you choose? We’ve got quite the array of options here in the US and we saw plenty of them! “Yummy” taken to a new level! We stopped at one of my fav bakeries for a special lunch out and filled up! THIS is what it looks like when we have unloaded our stuff into our hotel room for the night! NONE of this equipment can freeze, so it must come in with us at each place! THIS is what it looks like when we have to pack it all back into the van in the morning! Thankfully, the weather never got too bad - only into the single digits, so Dad didn’t even need to wear the coveralls he packed just in case of really cold weather. The town of Fishtail was adorable! Riza, one of the two owners of Tumblewood Teas took us on a tour of her tea production facility! The ladies have an amazing operation and supply teas to all sorts of places including National Parks. After hearing about the history of tea, the story of their company, how to brew a proper cup of tea, how they make all the different tea blends, and stories about how to source the best leaves from all over the world, Riza invited us to choose some samples from her racks! Oh, the choices! Mom, our biggest tea connoisseur, was in tea heaven! She and Dad drink loose leaf tea every morning (and often multiple times per day) and Tumblewood Teas was definitely a highlight of the trip for her! What??? …when you arrive at a venue and one of your outfits matches the back stage curtain! 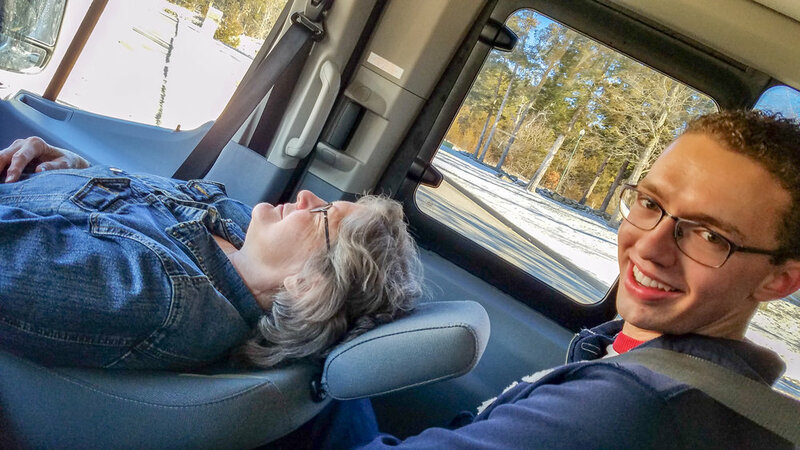 One day, after driving for many hours, we stopped at a Montana Silver Smith to browse and enjoy the fresh mountain air. 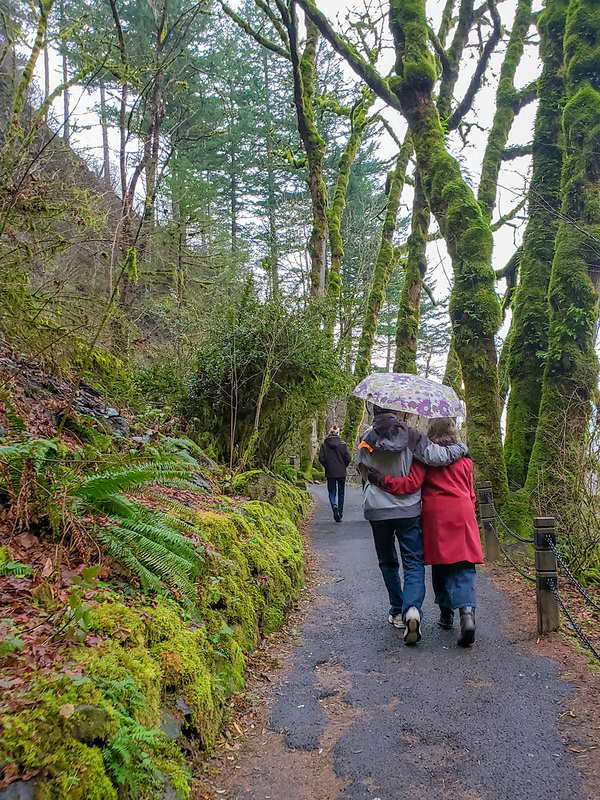 The two love birds, walking up to see Multnomah Falls in Oregon. 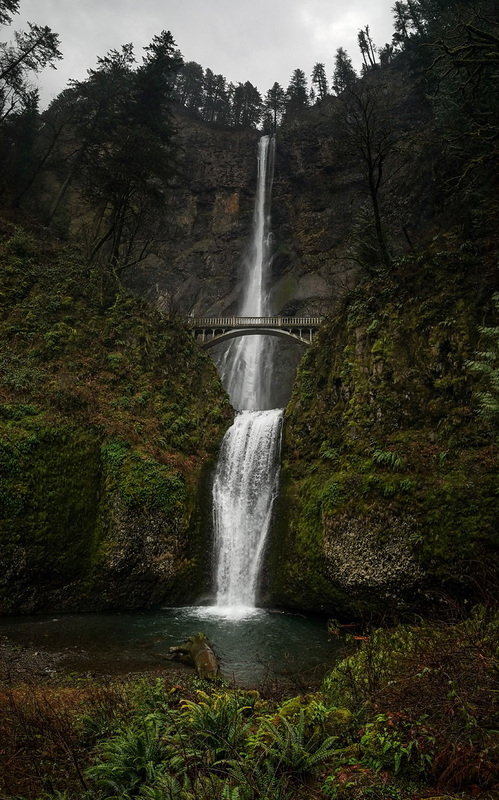 Multnomah Falls in all its regal beauty! Haystack Rock on the coast of Oregon. Rainy. Cold. Wet. Ready for adventure? Silas and I (Laura) took off our shoes and ran out through the water to see a close-up view. Totally worth it. Before our next show, we toured Tillamook Creamery! For pretty much all of our growing up years as kids, it was a family tradition to eat ice cream every Sunday afternoon. We had been on the lookout for a good huckleberry ice cream on our trip, and we couldn’t resist their local marionberry too! Our first time trying Vietnamese! As big believers in exploring new foods and cuisines, we have had some interesting experiences over the years. This one rated highly for some… and low on the list for a couple of others! It’s a cacao bean! One of the owners at the incredible Creo Chocolate gave us a lesson on chocolate and we had fun trying the beans plain, and then getting a few chocolates for the road. Have any of you tried Truffle Mushroom Chocolates? They were surprisingly good, and Abigail’s favorite! Setting up for another show! People LOVED the fun lighting that Luke brought along for the road shows! It kept both babies and adults alike entertained! Meet our INCREDIBLE booking agent and guide for this tour! Thank you so much, Allen for your hard work! You and Dorothy were amazing to work with and we couldn’t have asked for a better couple to share our weeks together on the road! We will always remember our time with you. After finishing our shows in Oregon, we had figured out that if we did a very long day of driving, we could spend some time hiking in Arches National Park! It was totally worth it to see God’s incredible creation and get some fresh air after sitting for so long! Since it was kinda cold and we had some snow, there weren’t many visitors to the park, so we had it mostly to ourselves! The park ranger said that in the summer during peak tourist season, it feels like 110 degrees when the heat is reflecting off all that rock! Throughout the tour, we met many amazing people, saw some of our good friends when we came through their area, were able to see grandparents and people from Mom and Dad’s high school at a show, and got to spend one night with cousins. We were blessed by all of you people! We’d love to see you again, but this time here in Branson! Some of you have already come from Oregon to see us here at a show - thanks so much! No big trip or accomplishment is complete without a celebration of all the hard work! An ice cream cake fit the bill perfectly this time.